All Airel ever wanted to be was normal, to disappear into the crowd. But bloodlines can produce surprises, like sudden mysterious illness. Then there’s Michael Alexander, the new guy in school, who is impossibly gorgeous…and captivated by her. Somewhere in the back of her mind she can hear the sound of pages turning, and another, older story being written. It is the story of an ancient family, of great warriors, of the Sword of Light, and the struggle against an evil so terrible, so far-reaching, that it threatens everything she hopes for even now. Thank you StoneHouse Ink for sending Airel! 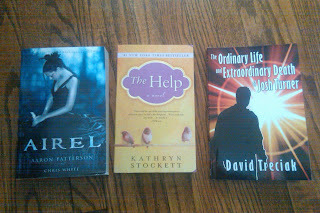 Want to Thank JJ from JJireads for sending The Help after I won it in a giveaway on her blog. Chose The Help because I recently watched the movie and it was fabulous. I look forward to reading and reviewing the book as well. Summary: Josh Turner wasn't happy about dying. In fact, he was downright infuriated about it. All his life he'd heard about other people's deaths - in a bus crash on the freeway or a ship sinking in the ocean - and think to himself, I'm glad it wasn't me. But now it was him. And all he could do was wait for the end, when he would find himself crossing over to... where exactly? Thanks, Amberlin Press for sending me this book to review. Nice! The Help was amazing I hope you like it. And I also want to read Airel - just the cover alone is great. I must read The Help soon! I have had it forever. Yay! So happy you got it. I readit and it was sooo good. I was so moved I cried reading the book. Haven't seen the movie yet.